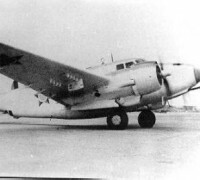 VP-211 27 Sep 1943: VP-211 received orders to deploy to NAF Aratu, Bahia, Brazil. The squadron’s last section of four aircraft arrived at Aratu on 16 October and relieved VP-74, coming under the operational control of FAW-16. VP-211 became a part of Task Force 44, an integral part of the Fourth Fleet. A detachment of six aircraft was maintained at Governor’s Island, NAF Galeao, Rio de Janeiro, Brazil, due to the distance of Aratu from the “slot” where U-boat hunting was so abundant. The slot was the area where the U-boats traversed the Atlantic from north to south via a regular route. On 12 November the squadron shifted its headquarters to Galeao for a three-month period, leaving a three-aircraft detachment at Aratu. NAF Galeao, while nearer to the hunting area, had primitive living conditions and frequently was shrouded in early morning fog. The squadron’s first searchlight mission was conducted in February, and from that time on, nearly all of the squadron’s patrols were conducted at night. Jan 1944: The squadron’s 14 to 16 hour patrols began to take their toll on the aircraft. Maintenance facilities in the area were very basic, so engine changes were made at sea off Florianapolis, Brazil. Engine changes were made in four sections of three aircraft each, with one Mariner undergoing the change, while the second stood by to assist in the maintenance, with the third hauling supplies, gasoline, personnel and food. 12 Jan 1944: The squadron suffered its first operational loss during a training exercise when Ensign Thomas E. Donahue and crew P-8 dropped a depth charge from too low an altitude. 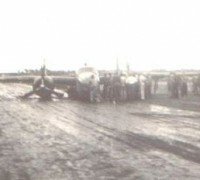 The munitions exploded near the tail, causing the plane to crash and burn. Crew P-4 landed immediately and rescued five critically injured survivors from the water. Feb 1945: VPB-211 was temporarily based aboard Rehoboth (AVP 50) at Bahia Bay to assist in the training of the ship’s crew in handling seaplanes at advanced bases. 1–31 Mar 1945: The squadron was temporarily based aboard Rockaway (AVP 29) for advanced base training. Apr 1945: VPB-211 was based aboard Humboldt (AVP 21) at Bahia Bay to assist in the training of the ship’s crew in handling seaplanes at advanced bases. The squadron personnel speculated that all this training might be in preparation for the imminent transfer of VPB-211 to the Pacific theater of operations. 16 May 1945: Convoy patrols were discontinued. On 24 May orders were received to turn over the squadron’s aircraft to HEDRON-11 at NAS San Juan, P.R., and proceed to NAS Norfolk, Va., for disestablishment. 1 Jan 1945 NAS Norfolk, Va. 24 May 1945. 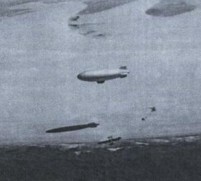 Volume 2 Squadron PMB-3s in formation flight in Brazil.